EcoRaider Attending Pestworld in Phoenix! EcoRaider was pleased to attend this year’s Pest World Expo in Phoenix, AZ, sponsored by the National Pest Management Association (NPMA.) Every year over 3,000 scientists, vendors from all aspects of the pest control industry, and pest control professionals from around the world gather to exchange ideas, and learn from experts in field of pest control management. Among the many educational sessions at this year’s Expo was a presentation by Dr Dini Miller, PhD of Virginia Polytechnic and State University, Blacksburg VA, who described some other latest research into bed bug behavior, and some of the causes for the recent proliferation of bed bug infestation.. Notable is the fact that bed bugs are highly mobile creatures. An infestation in a single apartment unit can easily spread to an adjoining apartment in as little as 48 hours in search of a host — a human — to feed upon. Complicating matters, the rapid reproductive cycle, and the fact that bed bugs are increasingly developing resistance to many of the commonly used pesticides and treatment protocols. In fact, a recent survey of pest control professionals around the country found that 78% of these professionals considered bed bugs the most difficult insect pest to control. As science advances in understanding of bed bug behavior, and physiology, EcoRaider will continue to be on the forefront of the effort to bring this pest under control. https://ecoraiderusa.com/wp-content/uploads/2016/05/EcoRaider-Logo_340.png 0 0 Todd Zon https://ecoraiderusa.com/wp-content/uploads/2016/05/EcoRaider-Logo_340.png Todd Zon2013-11-13 00:51:172015-03-18 00:58:07EcoRaider Attending Pestworld in Phoenix! New Brunswick, NJ (PRWEB) June 13, 2013. 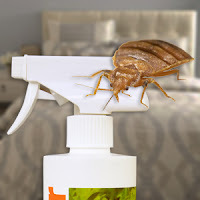 A study was conducted by the Rutgers University Entomology Lab recently comparing effectiveness between some most seen over-the-counter products and identified EcoRaider, a product provided by Reneotech Inc, as the top bed bug killer among 11 other brands. This study highlights the effectiveness of this all-natural bed bug spray and provides an alternative for synthetic pesticides being used inside a home. With the expense of heat and steam treatments often the only alternatives pursued by homeowners, an effective and safe do-it-yourself solution to complement or replace such costly efforts has been pursued. With many products on the market making unsupported claims and with limited government regulation, the need for a scientific study was necessary to clarify which products are truly effective. In addition, the Federal Trade Commission has grown increasingly concerned about unsubstantiated claims from bed bug sprays both in terms of their alleged effectiveness and their safety claims. This resulted in fines of several hundred thousand dollars administered by the FTC. One manufacturer even claimed their spray created an “invisible barrier” against future infestations. Now in addition to the pain and discomfort of a bed bug infestation, add the liability. According to a report from New York Daily News posted on June, 3rd, a jury in Maryland awarded $800,000 to a tenant who proved that her landlord did not treat the problem properly and harassed her when she complained. Bed bugs continue to be major problems, mainly in cities where they can be carried to new apartments and homes nearby quickly. Whether they are traveling on their own or hitching a ride on clothing, bedding or furniture, bed bug infestations have grown to epic proportions over the last several years. Despite treatment by pesticides, steam and heat, they persist. Therefore the search for a reliable, effective treatment alternative has been actively pursued. EcoRaider was created under the call for such demand. Its core ingredients include extracts from multiple aromatic plants that have natural insecticidal power and other safe content that is used in many cosmetic products. Safe as it is, yet it works powerfully on bugs. To quote the study, “EcoRaider caused 100 percent mortality after 10 days.” Both the strength and long-lasting nature of the spray were noted as being unusually effective for natural products rather than synthetic ones. “While the study shows 10-day residue efficacy of EcoRaider, actually 90% of the bed bug were killed in the first hour,” Mr. Yancoskie pointed out. EcoRaider has a unique- micronized high penetration delivery system that can easily get through the insect skeleton and even the egg shell. Natural active ingredients with special insecticidal power are encapsulated in micro-scale particles by means of a scientifically formulated emulsion system which consists of bio-friendly surfactants and synergists derived from natural sources. The delivery system acts as a booster rocket that carries the active ingredients into the insect’s body and lets it attack from the inside. Even the slightest amount of contact with EcoRaider is lethal to a bed bug. Therefore, before you engage a company to do the job – which often requires multiple visits over a period of time, you may wish to try products such as the top-rated EcoRaider, which can be much more cost effective when used in the recommended ratio of 1 gallon per 1,000 square feet. With the high cost of full-house fumigation, you owe it to yourself to try d-i-y products first, especially when the latest ones have been judged safe and effective.